Unfortunately, they have discontinued this sword after many years of production, BUT due to popular demand brought it back for a limited run! Well after almost 2 months of waiting this beauty showed up at my door from Reliks. Once they got it in stock it only took 3 days to get here. 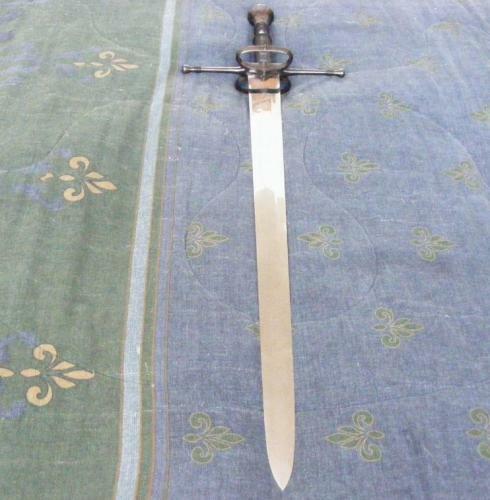 I had been eyeing it up for a while, as I wanted a sword I could use with a shield but have enough room on the hilt for a two handed cut. Its a bit shorter than I was expecting (not a bad thing though). It was well packed in paper and bubble wrap and the box was quite big. I kept digging deeper wondering "where is it? Did they send the wrong one?" Nope its exactly what I was hoping for. 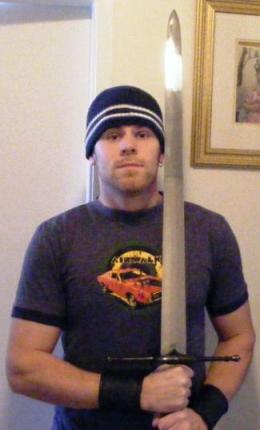 It was well oiled but the blade had a few scratches on the otherwise mirror finish. The first thing I noticed when I finally got it unwrapped was the size and balance. I'd heard the cross was overly heavy and affected the balance and performance. I beg to differ. POB is 2.75 inches from cross-guard. This thing is FAST!! 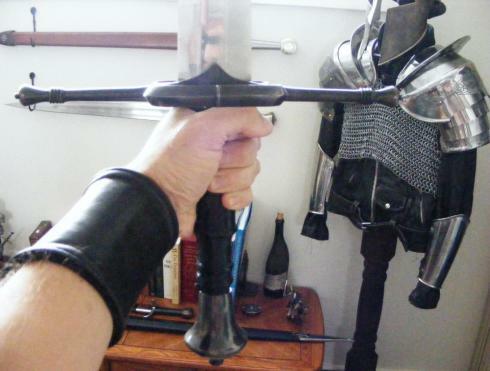 With one hand and shield it is well balanced and easily manoeuvrable....doesnt feel like 3lbs.10oz. Wielded with two hands it is lightning fast and superbly lethal!!! 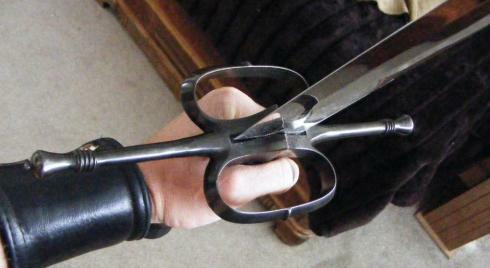 I cant wait to get it sharpened and do some cutting. 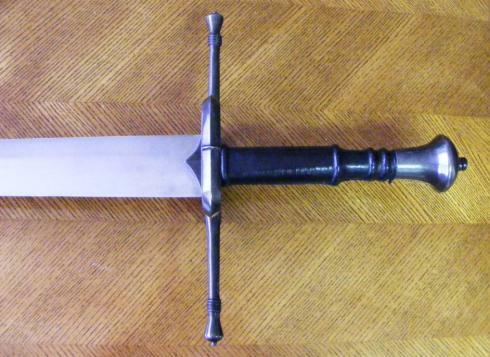 The blade tapers from 2" at the hilt to 1.25" before coming to a point in the last 1.5". The blade has no fuller, instead it is a lenticular shape. 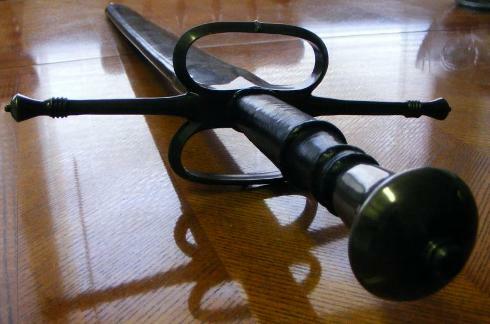 It is quite stiff....when struck hard on the pommel the tip moves about 1.5 inches total! Not in the least bit whippy unlike my other windlass. Sorry I forgot to take a pic of the blade flexing but I can flex it 6" out of true (with some difficulty on the last 2" or so) and she sprang back true. The whole thing is tight...not a rattle and yes, it is peened so if it develops a rattle it will be an easy fix. The grip is probably wood with cord for the risers and wrapped in black leather. Pommel and cross are blackened giving it an antique look that attracted me to it. The grip is comfortable and there is just enough room for two hands. The pommel is perfectly shaped to comfortably rest the heel of my palm on with no digging. I love the side rings, (which is odd for me....never liked them before), as they offer superior hand protection. 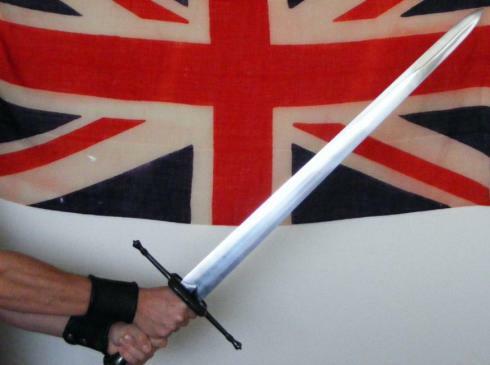 This sword stays fairly true to the original, A477 of the Wallace Collection. There are differences though...the original had a fuller groove, and the peen block was slightly different. The grip on the original was just cord I believe, but overall Windlass has done a great job on this sword. 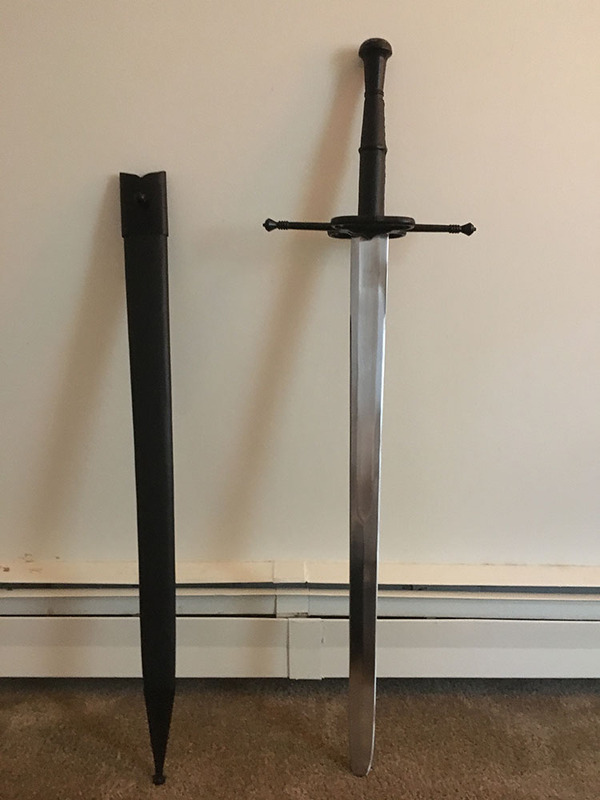 As mentioned in the review, this sword was once discontinued but has been brought back and you can buy it HERE - same sword, same price ($215 direct from Museum Replicas but you can pick it up for $193 by using the SBG 10% Discount Coupon Code SBGVIP (or tell them the code for a phone order, 1-800-883-8838).